‘The Bible is really a trilogy.’ Are you thinking about seeing The Book of Mormon? Did you know that the show’s co-creator, Matt Stone, once called it ‘an atheist’s love letter to religion?’ Read below for an everything-you-need-to-know-guide about ‘God’s favourite musical’ from the creators of South Park. The Book of Mormon follows two Mormon missionaries, Kevin Price and Arnold Cunningham, who get sent to a remote village in Uganda to spread the word of The Church of Jesus Christ of Latter-day Saints. The two young Mormons find their mission rather difficult, however, as the villagers are more concerned about the various pressing issues they face, including famine, AIDS, and oppression. You’ll have to see for yourself whether Elder Price and Elder Cunningham's mission proves successful. Who created The Book of Mormon? The musical was created by South Park creators Trey Parker and Matt Stone (who are also known for their 2004 comedy film Team America featuring a cast of marionettes) along with American songwriter of musicals Robert Lopez, who is best known for co-creating Avenue Q and composing songs for one of Disney’s highest grossing films of all time, 2013’s Frozen. Parker and Stone saw Avenue Q in 2003, after which they met up with Lopez and began developing the The Book of Mormon. What inspired The Book of Mormon? Trey Parker and Matt Stone have long since referenced Mormons in their work. A South Park episode entitled “All About Mormons” in 2003 aired that parodied Mormonism, though the creators admitted that it was difficult to poke fun at the religion due to how nice and good-natured Mormons are. The episode features a sub-plot about the founding of the religion by Joseph Smith and the various flaws and inconsistencies that Stan notices in the story. The episode was voted the best from the show’s seventh series and many themes were transferred into the Book of Mormon musical. The South Park creators visited Salt Lake City, Utah (a hub for the Mormon religion) and met with many current and former Mormon missionaries for research on the stage musical project. How did the LDS Church react to the musical? 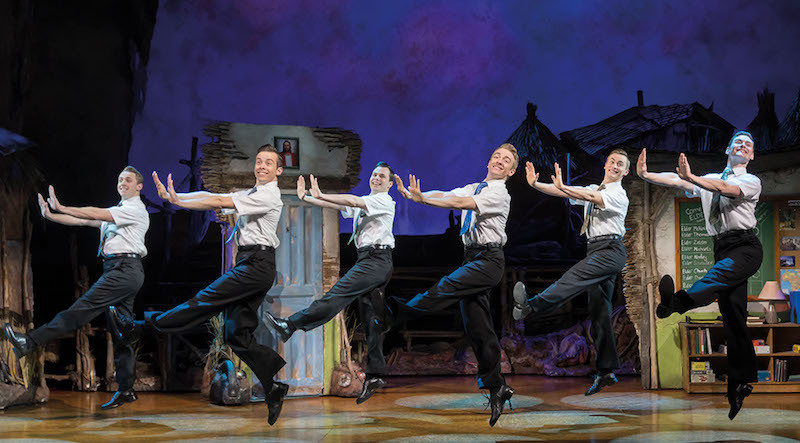 Upon the musical’s premiere, an official press release from the Church of Latter-day Saints stated that The Book of Mormon might be entertaining for a day, but that the religion itself can change your life. The church used the musical’s high-profile platform to its advantage and frequently advertised in the show’s playbills with such taglines as “You’ve seen the play, now read the book” and “the book is always better.” American actor Josh Gad, who originated the role of Elder Cunningham for Broadway, stated that the show had never received a complaint from a practicing Mormon who saw the show but, paradoxically, he had heard of a few people taking up the Mormon faith upon being moved by the performance. Who stars in the West End production? The show currently stars newcomer Dom Simpson as Elder Kevin Price, J. Michael Finley as Elder Arnold Cunningham, and Leanne Robinson as local Ugandan villager Nabulungi. Simpson trained at the Arts Education School where he graduated in 2016 and previously made his theatrical debut as a standby for Elder Price in the Broadway production of The Book of Mormon. Finley’s stage credits include Chicago, Les Miserables 25th Anniversary, and a standby for Elder Cunningham in the Broadway production of The Book of Mormon. Robinson starred in the US/Canadian National Tour of The Book of Mormon before debuting in the West End. The actress was trained at The BRIT School. The Book of Mormon also stars Steven Webb as Moroni/Elder McKinley, Richard Llloyd King as Mafala Hatimbi, Dean Maynard as Price’s Dad/Joseph Smith/Mission President, and Michael Moulton as General/Satan. What are some of the show’s songs? Where and for how long is The Book of Mormon running? The Book of Mormon is currently booking until 10 November 2018 at the Prince of Wales Theatre and remains one of the most popular shows in the West End. Purchase your Book of Mormon tickets here.